Google Webmaster Tools is one place from where website or blog owners can see and manage their website status as in Google index. It has undergone interface makeover for more cleaner and feature laden look. It has also launched a new feature ‘Change of Address’ that should come handy if you are moving whole website to a new domain name address. 1. Setup new address in your Google Webmaster account. 2. Use 301 redirect to permanently redirect pages to your new site. 3. Make sure newly added site is verified by HTML file or meta tag method. 4. 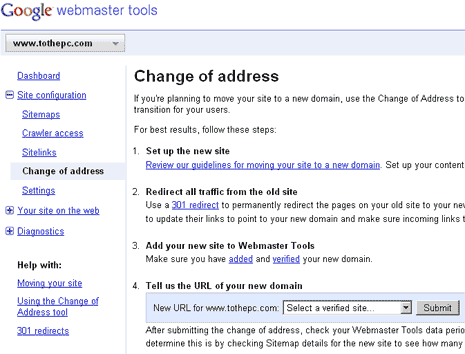 Within Google Webmaster Tools, Goto Site Configuration > Change of address. Select new address of your website from drop down menu and click submit. Submitting website information to Google Webmaster Tools is not mandatory but it highly recommended to keep track of your website status in Google index. You can track lot of information like incoming search keywords, rankings, page rank status and more. New interface looks cool but How about adding another feature of ‘Change in Permalink structure’? Webmasters change permalink structure more often than domain address, listening Google?